Whether looking for affordable Funeral Options or Cremation Services, Destiny Funeral Home & Crematory is your local funeral home located near Stanton CA and can service and cater to the families in the surrounding communities such as Signal Hill and Bixby Knolls CA. 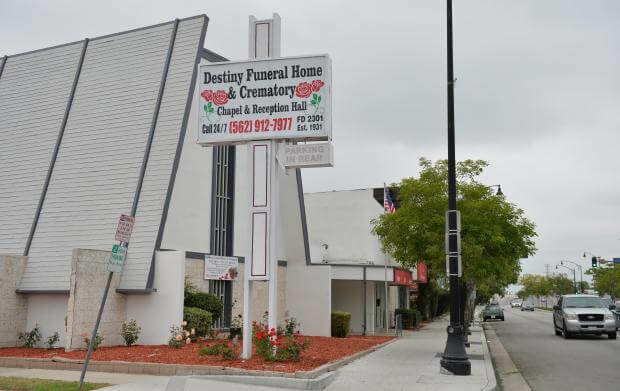 While there may be other reputable Funeral Homes in Stanton CA serving families, Destiny Funeral Home & Crematory is there for you and stands by you every step of the way to ensure we give your loved one an honorable Funeral Service. Click for information about Cremation Services in Stanton CA. One way is to bring personal items into the funeral home to be displayed in or near the casket. Example: An avid golfer might have a favorite putter placed in the casket. An avid hunter or fisherman might have some of their personal effects or trophies displayed on a memory table. A person who quilted could have the casket draped with a quilt they made. An artist could have their art work displayed. A persons favorite rocking chair could be brought to the funeral home and placed next to the casket.